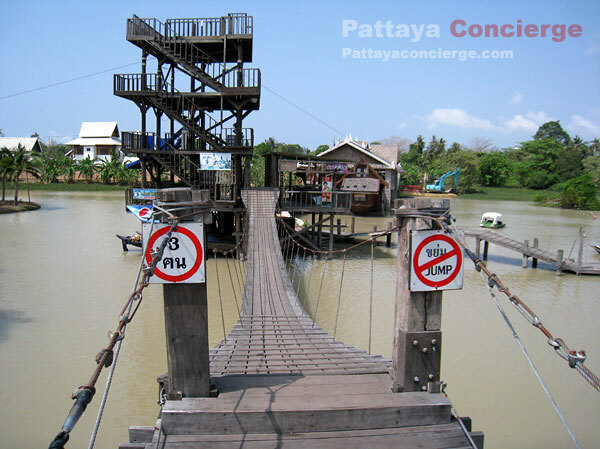 Pattaya Floating Market has been a major attraction in Pattaya that visitors would like to visit. 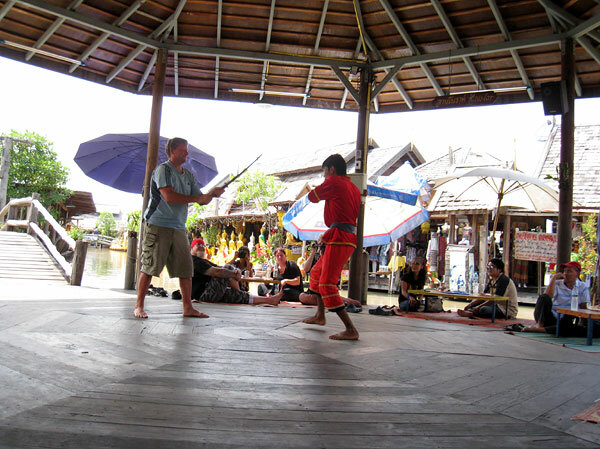 Activities, traditional shows, and a variety of items available there would be a key reason to attract visitors. Bus service has also been available to facilitate transportation difficulty. 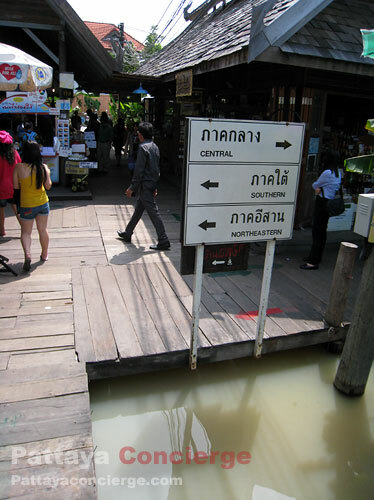 Pattaya Floating Market is established under the concept of presenting Cultures and traditions of 4 regions of Thailand - Northern, Southern, Central, and Northeasthern. 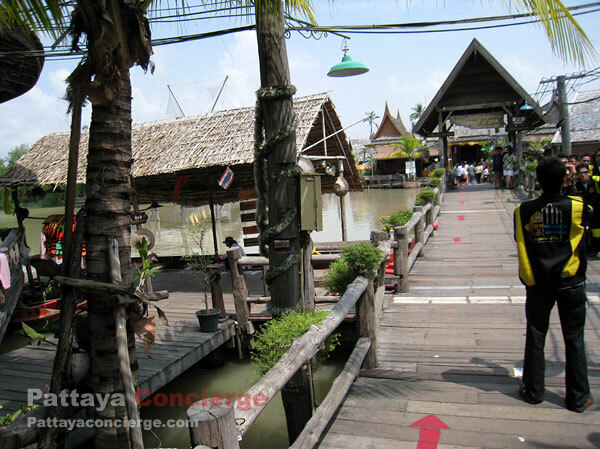 The concept covers how people from these 4 regions live, what their main activities are, and what the main products from there are, so the floating market could indicate what people in different areas live and what they earn from their ancient times. 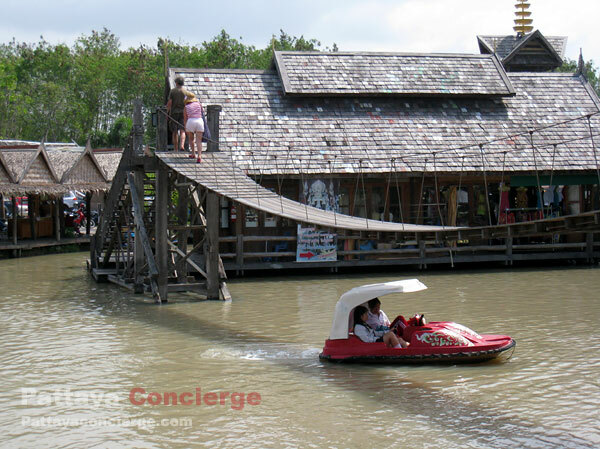 Additionally, Pattaya Floating Market is the largest floating attraction in East of Thailand, which would encourage more visitors to come to Pattaya. 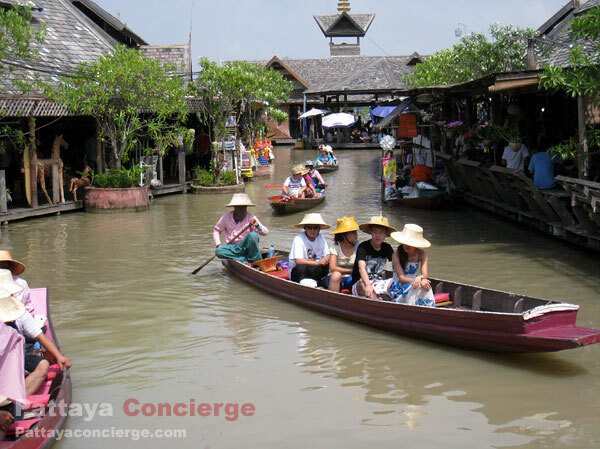 Pattaya Floating Market not only presents cultures and traditions from different regions of Thailand but also presents niche products from there, such as wooden sculpture, silverware, textile, paper handcrafts, sailing-boat model, wooden-handmade bags, Thai silk, and so on. 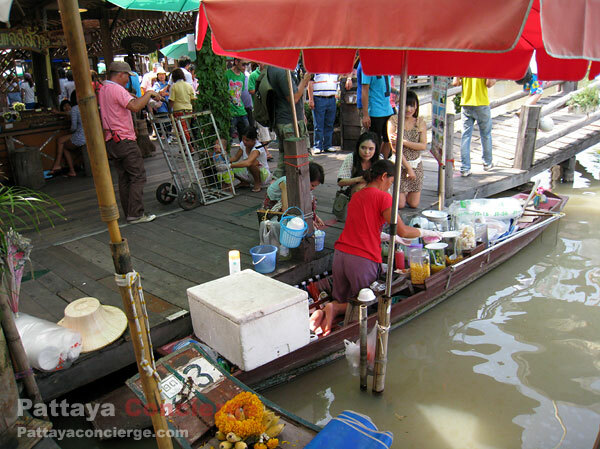 Not surprisingly, the visitors usually buy souvenirs or gifts for their friends and their family from this floating Market. 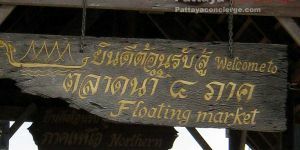 At Pattaya Floating Market, visitors can travel around the market by a boat in order to see view of the market on the boat. 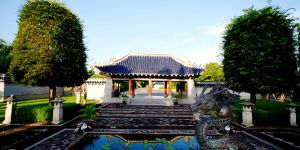 Also, visitor can taste Thai traditional food and dessert, can see live shows of Thai cultures and traditions of the main regions of Thailand, and can find different kinds of items in the market. Atfirst The charge of entrance fee here fee here is free, but nowsaday is 200 baht. 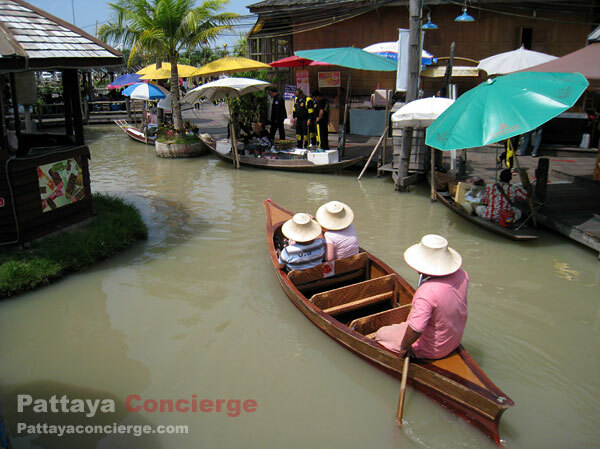 There are also buses available for visitors to go Pattaya Floating Market. However, there are only 5 times a day (every 2 hours). 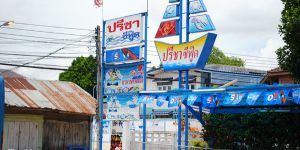 For taking a bus to the floating market, this could be the cheapest choice for visitors, approximately 20 baht, but visitors might need to check the time table of the beach bus services in order to know what time the bus will arrive at their closest bus stop. 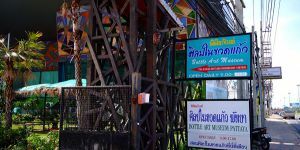 In the case that visitors are impatient, they can also go to the Floating Market by metered taxi or Song Thaew, but they need to pay higher. 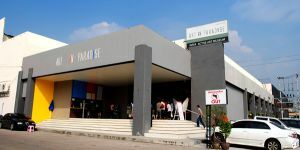 Thai Alangkarn Theater is one of interesting places in Pattaya for tourists to visit. 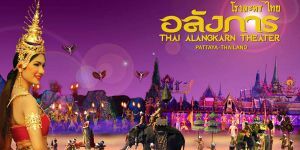 Instead of presenting the standard Thai traditional dances that could be seen elsewhere easily, Thai Alangkarn Theater presents Thai culture in a Panoramic concept - the set of multi-dimension techniques of presentation, including pyrotechnics, multi-color Laser show, and real surround sound system. 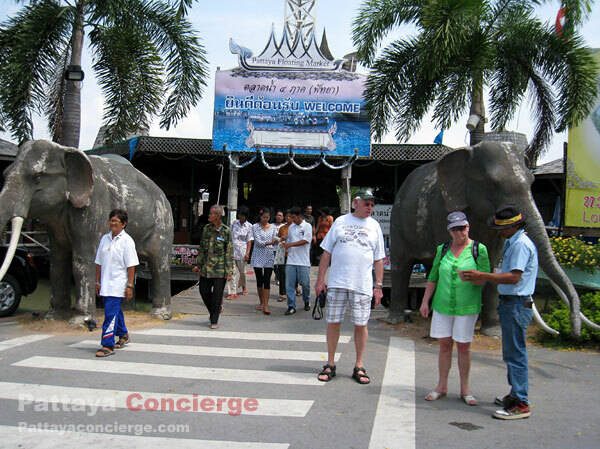 This kind of presentation will likely interest you as tourists visit Pattaya. Far from here about: 6.1 km. Far from here about: 6.2 km. Far from here about: 6.5 km. Far from here about: 7 km. Far from here about: 7.3 km. Far from here about: 8.7 km. Far from here about: 8.9 km. Far from here about: 9.4 km. Far from here about: 9.5 km. Far from here about: 1.4 km. 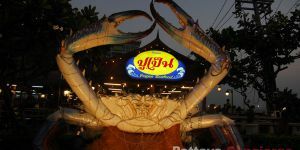 As the name of the restaurant means "living crab", Pu Pen is a restaurant mainly offering fresh seafood dishes. 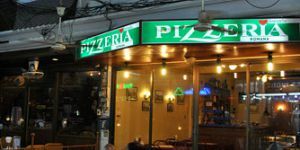 The restaurant's atmosphere is good as it is located next to the sea, and because of that sea view is another lovely factor apart from delicious seafood that customers can enjoy about. 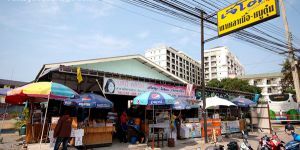 Food price is also reasonable, where it is not expensive even for Thai customers. Additionally, customer can order the set of dishes provided by the restaurant, which the price will become cheaper. 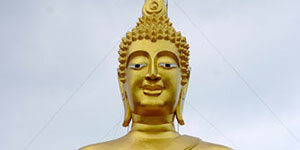 It is also easy to find Pu Pen restaurant since its location is at the end of Jomtien beach. 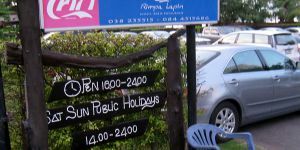 Note that customers should make a reservation before going there on weekend or any public holiday. 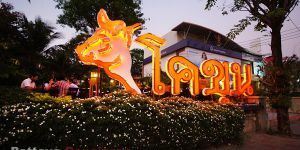 When talking about great seafood restaurants in Pattaya, Lung Sawai Restaurant is definitely included in the list. 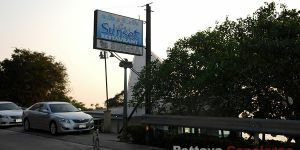 As delicious seafood and inexpensive price provided, the restaurant has constantly become more renowned. 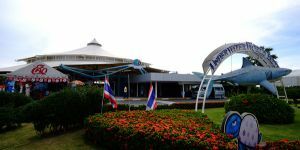 The restaurant is not just famous for foreign visitors, but also Thai visitors. 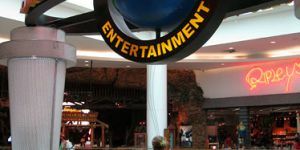 The restaurant is quite large, being able to take care of approximately 500 customers. This is because there are 2 parts of the restaurant for customers to choose. 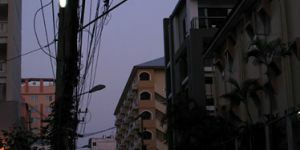 One is in front of Jomtien beach, while another one is row house on the opposite side. 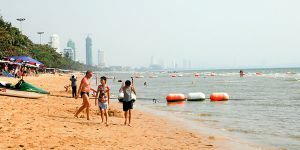 The location is at Jomtien Beach. Note that on Friday  Sunday, there are a lot of customer coming to the restaurants. Far from here about: 2.4 km. 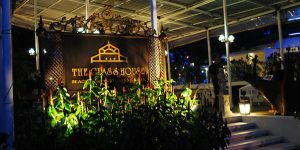 The Glass House Beachfront restaurant and bar is one of most romantic places not far from Pattaya City. 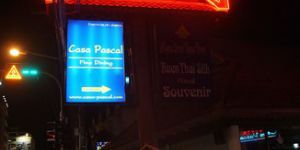 This restaurant and bar is so famous that both Thai and foreign customers come to enjoy every day. 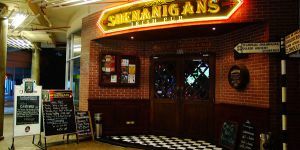 There is a variety of food choices available in the restaurant, Thai and international food, desserts, a range of alcohol. 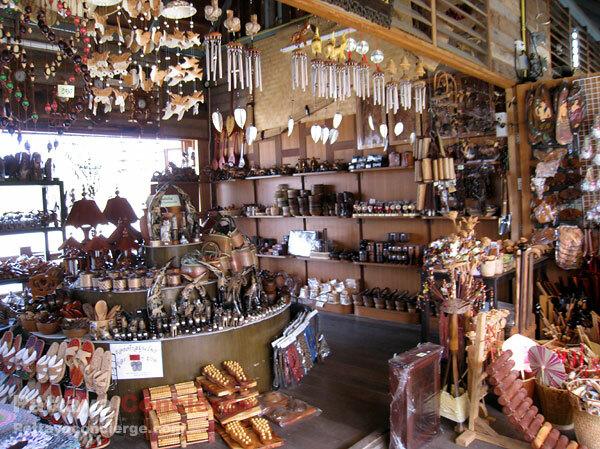 Although the price is higher than standard, customers are still satisfied to natural and romantic atmosphere. 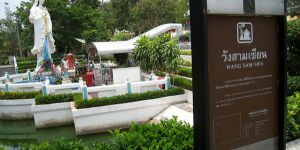 Its location is at 10 Na Jomtien (a little before Ambassador Hotel). Far from here about: 2.9 km. 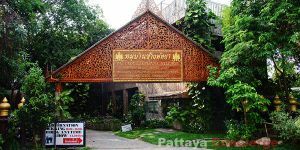 Somtam Pa Mon is a famous restaurant in Sattahip, near Pattaya. 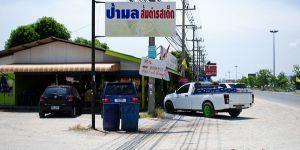 At first, this restaurant wan well-known only by locals, but currently, there are a lot more (Thai) visitors going to taste the food. This is because great points of this restaurant, as good taste and inexpensiveness, have been presented through some media already. 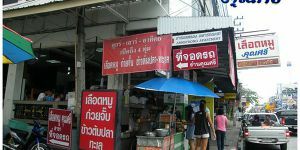 There are also a lot of food choices for Thai-northeastern food style. Not surprisingly, this restaurant becomes more and more popular recently. 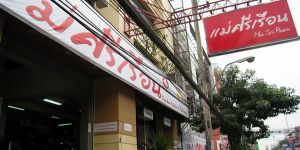 The location of the restaurant is at Baan Amphoe, near Ambassador Hotel. Far from here about: 5.4 km. 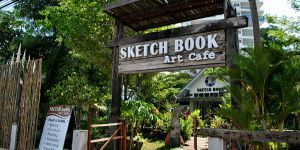 Preecha Seafood Restaurant is one of most recommended restaurants in Sattahip. 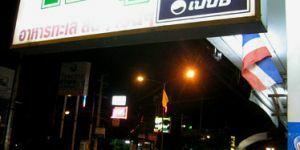 Because it is not so far from Pattaya City, there are lots of customers visiting the restaurant. 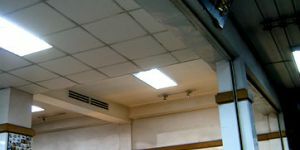 Freshness of food material and inexpensive dishes are a great point of this restaurant. There are a lot of tables and a large parking are to support a number of customers. 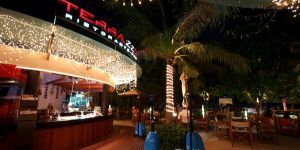 Besides, the restaurant is next to the sea, so customers can enjoy sea view and sea beach here as well. This is why this restaurant is recommended by tons of people. Far from here about: 7.1 km. Far from here about: 7.2 km. This is one of most spectacular restaurant in Pattaya because of beautiful and romantic view from the restaurant thats next to a cliff. This can be suitable for either a couple or friends to come together. 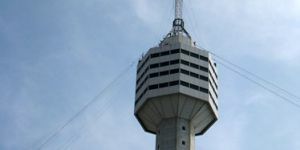 Round-circle view is also offered in Rimpa Lapin restaurant, where it is quite difficult to find somewhere else. 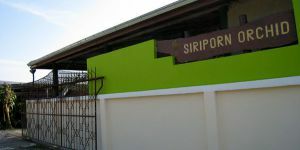 Furthermore, visitors can find seafood, Thai food, and Europe food at this restaurant. Unfortunately, in exchange to the unbelievable view, Rimpa Lapin is a bit more expensive than many restaurants. 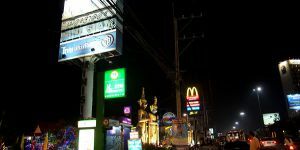 Another drawback is that the location is not in the Pattaya city. 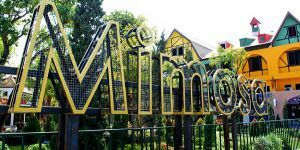 It is near Ambassador and Ocean Marina hotels,which are about 28 Kilometres from the city. Far from here about: 7.4 km. Far from here about: 7.7 km. Far from here about: 8.8 km. Far from here about: 9 km. Far from here about: 9.1 km. Far from here about: 9.2 km.